Seattle Super Bowl Bound After NFC Title Win Over Green Bay : The Two-Way The Seattle Seahawks defeated the Green Bay Packers 28-22 to win the NFC title. They'll face either Indianapolis or New England in Super Bowl XLIX. Luke Willson (#82) of the Seattle Seahawks celebrates after scoring on a two-point conversion during the fourth quarter of the 2015 NFC Championship game against the Green Bay Packers on Sunday. Seattle won 28-22. The Seattle Seahawks have defeated the Green Bay Packers to win the NFC title and earn their ticket to Super Bowl XLIX. Seattle won 28-22 in a game that saw the Packers pull out to a commanding early lead — going into the half 16-0. Seattle gained traction, however, scoring touchdowns in the third and fourth quarters to close the gap. 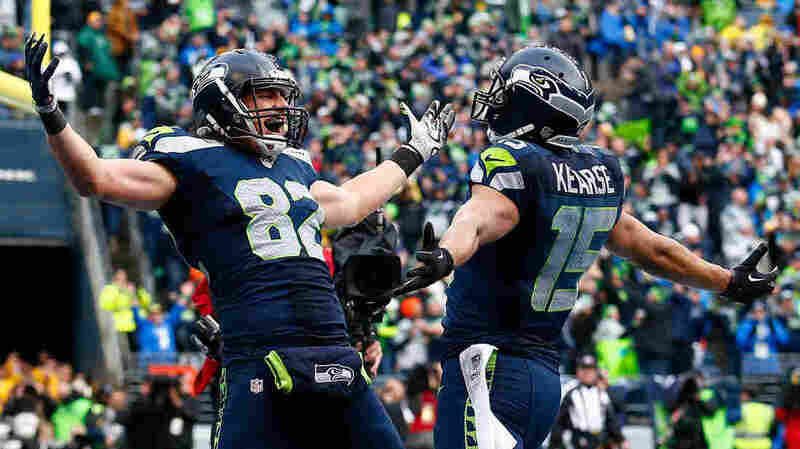 A recovered onside kick by Seattle late in the fourth quarter, which they capitalized on, scoring a touchdown and 2-point conversion, put the Seahawks in the lead for the first time the entire game. With just minutes left and one final drive, Green Bay answered with a 48-yard field goal to send the game into overtime. In overtime, Seattle marched their first possession up the field, cementing their win when quarterback Russell Wilson rocketed a 35-yard shotgun pass to Jermaine Kearse. The Seahawks will face the winner of Sunday's AFC title game between the Indianapolis Colts and the New England Patriots on Feb. 1. The Super Bowl will be played at the University of Phoenix Stadium in Glendale, Ariz.
Two games today will determine who goes to Super Bowl XLIX and who goes home. Two Midwest teams face off against two from the coasts. Defending Super Bowl champs the Seattle Seahawks play the Green Bay Packers starting at 3:05 p.m. ET at Seattle's CenturyLink Field for the NFC title. The Indianapolis Colts hope to defeat the New England Patriots beginning at 6:40 p.m. ET for the AFC championship. In ESPN's latest poll of NFL Nation reporters, the Seahawks are heavily favored over the Packers and the Patriots have the odds-makers against the Colts. Bleacherreport.com's take is similar. As Greg Easterbrook writes for ESPN: "The Patriots and Seahawks are peaking at exactly the right time. Seattle can beat the Packers in a playoff game at Green Bay." In September, Seattle beat Green Bay, 36-16. USA Today's Steven Ruiz says: "Of the two teams, the Packers clearly have more room for improvement since these two last met. [Green Bay Offensive Tackle Bryan] Bulaga is playing, [Seattle Wide Receiver Percy] Harvin is not and Green Bay's offense should have the entire width of the field at its disposal. It's hard to pick against this Seattle team, but it's even harder to bet against the best quarterback on the planet. Rodgers will make the difference in what should be a fantastic game." In the Colts vs. Patriots game, The Chicago Tribune writes that despite having lost by 22 points to New England earlier in the season, the Colts, "coming off three consecutive 11-5 seasons — have steadily gained postseason ground during that span. They lost to the Ravens in the first round in [Colts Quarterback Andrew] Luck's rookie season, pulled off a stunning come-from-behind victory over the Chiefs in the first round last season and now are one victory away from the NFL's marquee event." Gregg Doyel, writing in The Indianapolis Star, lashes out at the bravado among New England fans who he says, if they weren't so sincere, "you'd swear it was a lampoon of the area's haughty, arrogant stereotype." "They think it will be a blowout. A rout. They think, here in cold and crowded New England, that the Patriots will beat the Indianapolis Colts so badly in the AFC Championship Game on Sunday that this matchup, this very game, is a joke," he writes. "The Patriots are favored to win this game [by] most national experts, but Luck and crew enter having just knocked off Peyton Manning and the Broncos. If New England can come out hard and mount [an] early lead, something they haven't been able to do of late, there's a good chance they'll be headed to their sixth Super Bowl in 14 years."